You may assort the football colors in lots of 100 units using the same imprint color throughout the order. We recommend using Black or White imprint as is appropriate for assorted color promotional footballs. 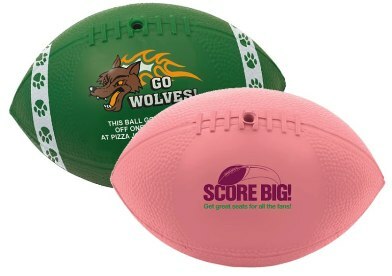 Change of ink or imprint color for assorted footballs add $35.00 per change, stripes to match. Nite Glow Footballs must be exposed to sunlight for a min of two hours to glow. Pantone Color Match add $45.00, not guaranteed on non white surfaces.